We provide world class Audio Visual and event production services using the latest technology and cutting edge solutions. High resolution LED walls, crisp audio visual, subtle (or not) lighting, dynamic projection, and custom scenic solutions will create the impact you demand for your meeting, event, exhibition or permanent installation, whether local or worldwide. Select Gallery to see some of what we do. Producers, meeting planners, event organizers, corporations, production companies, and exhibitors all look to Spectrum to create impact out of an idea. 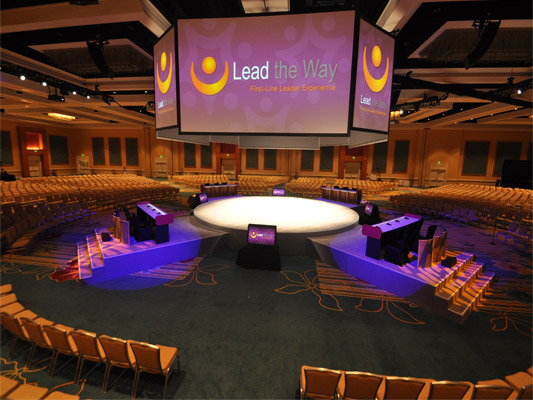 From in-the-round projection to multi-speaker, interactive audio, we make your vision a reality. Select Contact to find out how we can create a custom solution to fit your need. Conveniently based in Atlanta, Georgia, Spectrum services clients from Coast to Coast, and even internationally. Someone is available every hour of every day to assist you. Feel free to contact one of our dedicated team members to ask questions about your event. Enjoy our unrivaled technical support by selecting the button below.